SEATTLE – At this rate, Jose Altuve is going to find himself invited to participate in the home run derby – no matter what he claims. Altuve homered for the fifth straight game, Justin Verlander struck out eight of the first 10 batters he faced and finished with a season-high 11, and the Houston Astros won their eighth straight, beating the Mariners 3-1 on Saturday night. Verlander was overpowering early and didn’t allow a baserunner until Mitch Haniger’s solo home run with one out in the fourth. Haniger’s homer extended Seattle’s MLB-record streak of 17 games with a home run to begin a season. Seattle has 38 homers in 17 games but was held to a season low in runs. It was just the third time Seattle was held to fewer than six runs. Daniel Vogelbach singled leading off the fifth, but that was it for baserunners allowed. Verlander walked none, and only a rising pitch count equated an end to his evening. Still, he had plenty left in the later innings, hitting 98 mph with his fastball in the sixth as his pitch count neared the century mark. Verlander had allowed seven earned runs total in his previous two starts but made a few mechanical adjustments after looking at old video and got the results he wanted. Verlander did get one key defensive play in the fifth when Jake Marisnick made a running catch in deep right-center field on a drive from Ryon Healy. Off the bat, Verlander thought the ball was gone, but Marisnick chased it down to end the inning and save Houston a run. 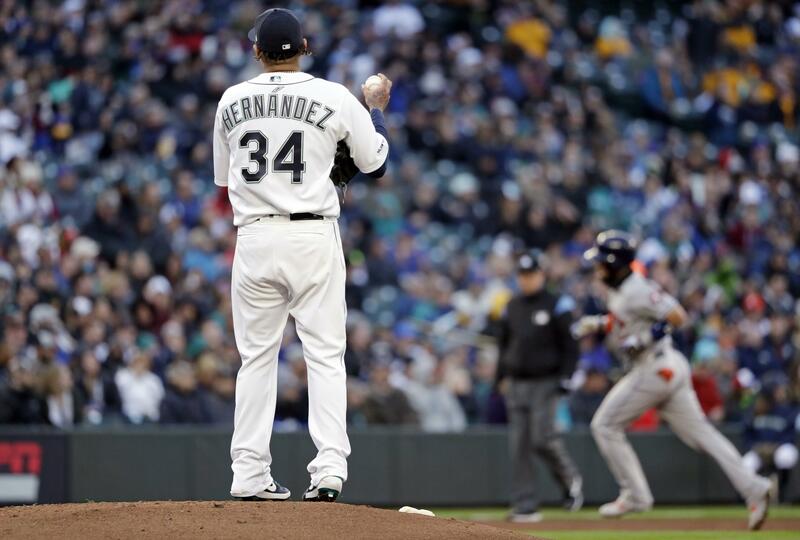 “We’ll take that outing all day long – I know he will, too – the rest of the season,” Seattle manager Scott Servais said. “If we could put that in a bottle for the rest of the season, he’d be happy with it and so would we. Astros: Gerrit Cole (0-2, 3.32) looks for his first victory. Cole has allowed three earned runs or less in each of his starts but has yet to earn a victory after going 15-5 last season. Published: April 13, 2019, 9:04 p.m. Updated: April 13, 2019, 11:13 p.m.